1 Monster, 2 Monster, 3 Monster, 4 these little monsters are something I adore! We wanted to up our candy apple game this year and decided on creating the most fun and whimsical candy apples I’ve ever seen. 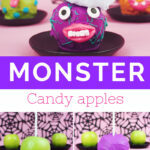 Monster candy apples that are hilarious and fun! The kids will think they are the best thing to have happened all season long. We’ve done a number of candy apple versions in the past, likes these hardshell apples and this caramel apple cake, but none as fun as these! 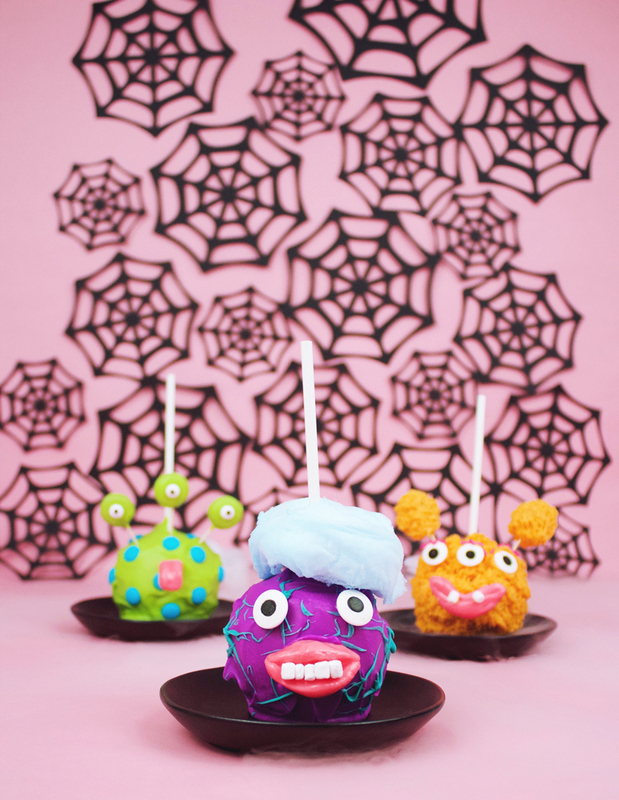 These cute little creatures are the perfect treat for your big halloween party! Each with their own little personality and flair. Make them for school, for home, or just for a fun kick off to the season of monsters and ghouls. 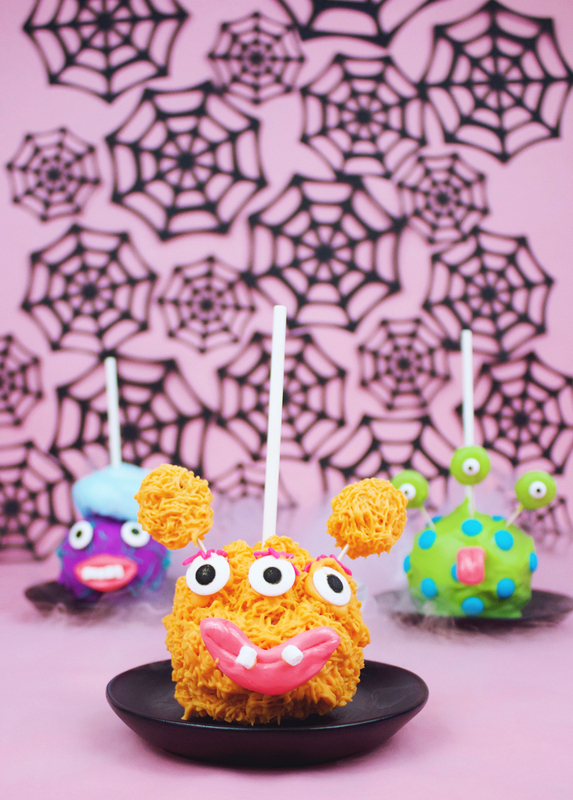 Take your candy apples to the next level with this fun monster version. Covered in yummy and ready for the kids these caddied apples will be the best thing that happens to Halloween this year. Start by inserting your candy stick into the center of the apple. Then melt your chocolate and cover your apple. Next use your melted chocolate to attach you embellishments, a little goes a long way. 1. To create lips or mouth, I use Laffy Taffy. I microwaved the laffy taffy for about 3-5 seconds to make it soft and pliable. 2. 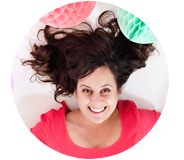 Add mini marshmallow to create the look of teeth on the candy apples. 3. Finally add a piece of cotton candy for hair. 1. 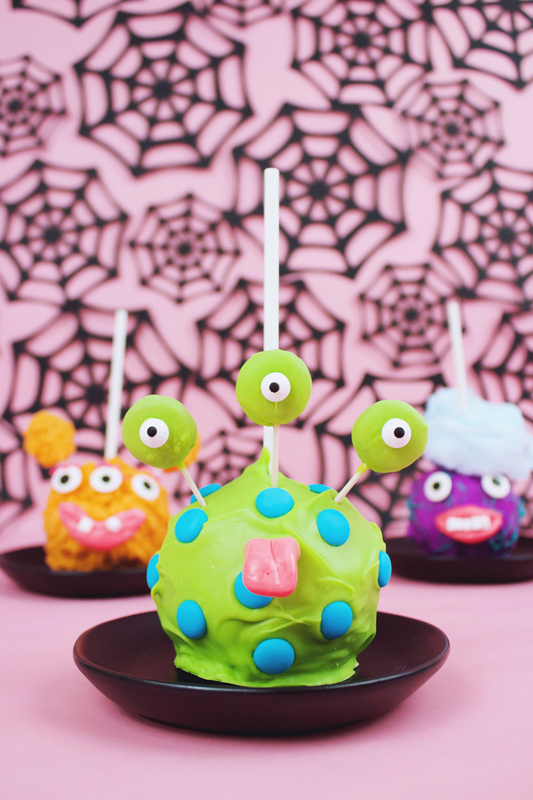 To create your candy apples monster eyes, stick a toothpick in between the cookies of the mini oreos. Then cover them in your melted chocolate. Add your eyeball candy and freeze. 2. Once your chocolate has set, insert the toothpick with the eyes to the body of the apple. 3. To create the tongue, I used Laffy Taffy. I microwaved the laffy taffy for about 3-5 seconds to make it soft and pliable. 1. Use your grass piping tool to create the monster fur effect on the candy apple. 2. To create ears, stick a toothpick in between the cookies of the mini oreos. Then cover them in your melted chocolate and create the same fur effect with your grass piping tip. 3. Next use your melted chocolate to attach your embellishments, a little goes a long way. 4. To create your lips, I used Laffy Taffy. I microwaved the laffy taffy for about 3-5 seconds to make it soft and pliable. 5. Add mini marshmallows to create the look of teeth. (Photography ©A Subtle Revelry by Whitney Gray).